Olson Homes debuting New Community in Orange on August 12! Olson Homes Debuts Single-Story Villas in Orange at Orchard Walk Model Grand Opening. Looking for a new home in Orange County? These Villas in Orange are centrally located in Orange County near all our favorite hot spots. What I love most about this beautifully planned community.... the energy efficient everything that goes into each Villa! I really think these Villas would be perfect for a single person or family. I myself am excited to check the Villas out after reading all the details. 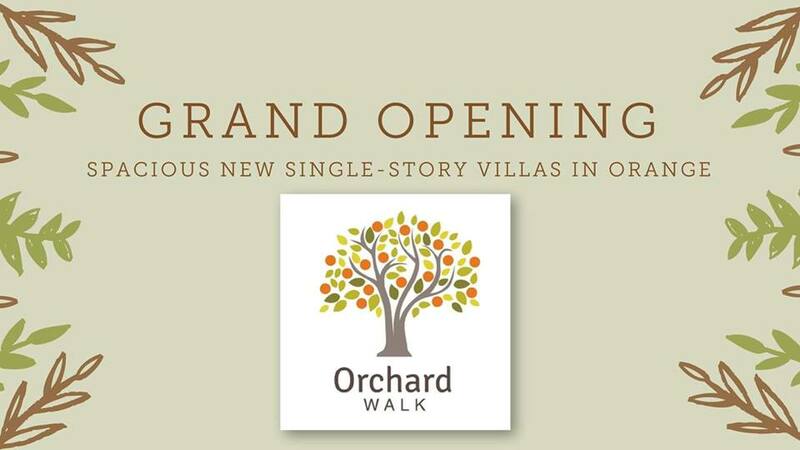 Olson Homes is bringing 37 brand-new single-story villas to Orange in their new community Orchard Walk! Home seekers far and wide are invited to the #OlsonOrchardWalk Model Grand Opening event on Saturday, August 12. Attendees will be treated to a tour of four fully-furnished attached model homes showcasing Olson’s expertise in home design and livability. The event will be held from 11 a.m. to 2 p.m. at 4700 E. Washington Avenue, Orange, CA 92869. Attendees can also enjoy light snacks, beverages, a balloon artist, and live music! For more information and to RSVP, view their Facebook event page HERE. Orchard Walk will present two and three-bedroom attached residences featuring Spanish architectural styles and modern style open layouts. Homebuyers can choose from four different floorplans ranging from approximately 1,340 to 1,566 square feet & up to 3 bedrooms. Each Olson Home includes energy efficient toilets, faucets, and other Energy Star appliances along with auto shut-off motion sensors in all baths and space saving tankless water heaters. Key safety features include automatic fire sprinklers, low VOC interior paint, and carbon monoxide detectors. See the full list of individual home details HERE. Orchard Walk boasts a prime Orange County location! Residents will be about 3.5 miles from Old Towne Orange, a hub for artisan style dining and shopping. Other popular attractions like Disneyland, Angel Stadium, Honda Center, and The Outlets of Orange can all be accessed within a 12 mile radius! Orchard Walk’s Welcome Center is currently open to help visitors get to know the neighborhood. Home Advisors on hand are ready to help prospective buyers learn about the qualifying and buying process. All interested buyers are encouraged to register for the Orchard Walk Interest List to receive information and updates about this community and future phase releases. Register for the Interest List HERE. Recognized as a leader in providing affordable urban housing throughout California, The Olson Company is dedicated to developing outstanding and long-lasting partnerships with the cities with which we work. Their approach to problem solving continues to be successful because they listen to the suggestions of city planners and officials and ultimately recognize that we are all committed to the same goal — serving the local community. Get social with Olson Homes and connect on social media! Summer is the most perfect time to see how wonderful a community can be. Everyone is outdoors, kids play, people commute, there are BBQ'S and a lot of some comunity events. Let me know what you think of the Villas at Orchard Walk!? Oh and a happy summer to you all... the team at Olson Homes in celebration of the Villas at Orchard Walk is hosting a giveaway!! Enter for a chance to win a $75 gift card to Orange Hill Restaurant!! Following on Instagram here and tag 3 friends in their Grand Opening Post for Orchard Walk here. You can enter by saying/marking they are "GOING" to their Facebook event here and tag 3 friends in the Facebook event. Don't forget to like and follow along on social too for all the latest updates with hashtag #OlsonOrchardWalk. Wow that's easy and a grrat prize to enter for. Orange Hill is one of my most favorite places to have brunch... reminds me of my mom. I love summer and I love Giveaways!